MapMint is a geographic information system (GIS) software on the Internet designed to facilitate the deployment of spatial data infrastructures (SDI). MapMint is for individuals and organizations wishing to manage and optimize SDI establishment and deployment of dynamic mapping applications. The application centralizes and simplifies a number of GIS and WebGIS functionality. The different levels of user rights divide tasks according to public (system administrators, GIS specialists, GIS technicians, cartographers, webmasters ...). MapMint includes several free software in a complete and coherent web mapping platform, whose operation is based on the use of open standards geomatics and internet. 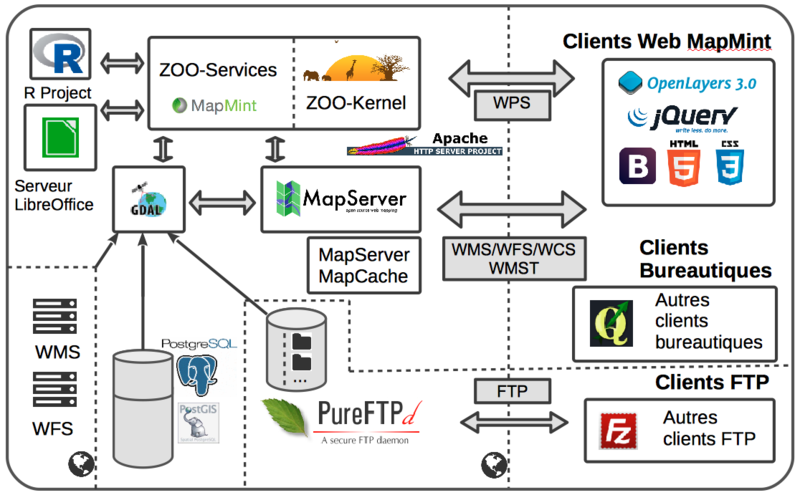 At the heart of MapMint we have the ZOO-Project, an application to simply and efficiently deploy WPS (Web Processing Service) data processing. A set of web services is available MapMint, from simple display of a web page in the application to complex geographical treatments. On the other types of web services are implemented, including visualization and querying spatial data, WMS (Web Map Service). Access to geographic data in vector format is via the WFS (Web Feature Service) or access to image data via WCS (Web Coverage Service). All these web services are provided by MapServer. The various files necessary for the functioning of MapServer and dynamic mapping applications are managed by MapMint services which provided a friendly interface for interact with these web services. ZOO-Project and MapServer applications based on an Apache web server to access the application via HTTP and HTTPS communication protocols. All the documents produced by the application, such as when using the pdf document production client module, use templates to odt file (OpenDocumentText). Document production is based on UNO (Universal Network Object) to interact with a LibreOffice server. An FTP server (eg ProFTPd) is generally associated with an instance of MapMint making available the directory dataPath/ftp order to file on the server large files or manage the templates in it. An overview of the architecture of MapMint is presented below. The interoperability of MapMint is provided by the standards used and implemented . It is thus possible to interact with data and services MapMint not only from the application accessible from a web browser but also from a desktop client type QGIS for example. To use WPS, WPS, download the plugin available here.